The north coast of Islay is little known and ranges from sparsely populated areas to completely uninhabited ones. The most striking geographical feature is Loch Gruinart, which takes a mile wide bite into the coastline and extends four miles inland, stopping less than 2½ miles short of linking with Loch Indaal and turning the north west of Islay into a separate island. On a sunny day, with a blue sky, white sand and turquoise sea, Loch Gruinart is a sublime place. At its head is the visitor centre for the RSPB's Loch Gruinart Nature Reserve. From here a single track road leads for over three miles up the western shore of the loch to the tiny settlement of Ardnave. A little short of the end of the road is a gate in the wall on its eastern side. This gives access to a track descending gently for 300 yards across a grassy field to the wall surrounding the churchyard of Kilnave Chapel. 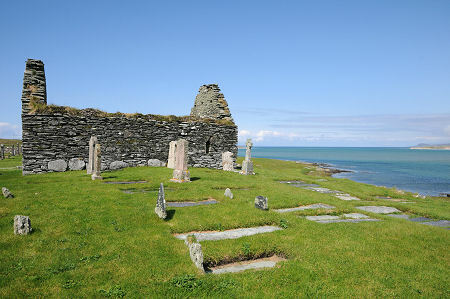 Kilnave Chapel, known in Gaelic as Cill Naoimh, stands on a sloping site just above the shoreline of Loch Gruinart. It comprises a roofless oblong with complete walls. The very low door in the west gable suggests that the floor level was originally rather lower than it is today. There are two narrow, arched windows, one towards the east end of the south wall, and the other in the east gable, offering modern visitors a glimpse of the loch. The chapel at Kilnave was built during the late 1300s or early 1400s. After the Reformation it became a subsidiary chapel serving this part of a parish whose main focus was at Kilchoman Church. 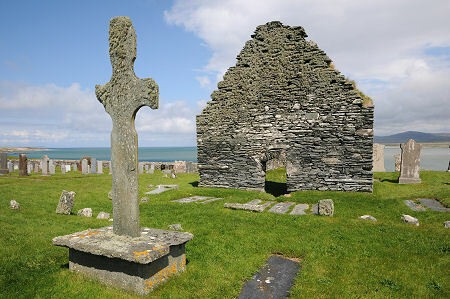 The chapel has a bloody history, being the site of an atrocity committed on 5 August 1598 during the Battle of Traigh Ghruinneart, which translates as "the Battle of Gruinart Beach". The background was the historical possession of Islay by Clan MacDonald, which in the 1590s made it the property of the MacDonald clan chief Sir James MacDonald. Conflict arose because of the claim by Sir Lachlan Mor Maclean of Duart on Mull, who was Sir James MacDonald's uncle, that in the 1566 the Rhinns of Islay had been given to him by Sir James' father, Angus MacDonald, as a dowry on the occasion of Lachlan's marriage to Angus's sister and James' aunt. Sir Lachlan Mor Maclean sought to claim what he believed rightfully belonged to him by landing in Loch Gruinart with some 800 men. Negotiations with Sir James MacDonald failed, and in the battle that followed, Sir Lachlan Mor Maclean and 280 of his followers were killed. MacDonald losses were fewer, but Sir James MacDonald was seriously wounded. Most of the surviving Macleans returned to their boats, but a group of 30 was cut off and retreated instead to Kilnave Chapel. All but one were killed when the MacDonalds set fire to the chapel's thatched roof. The surrounding churchyard is home to many grave slabs which probably date back to the early period of the chapel's life. 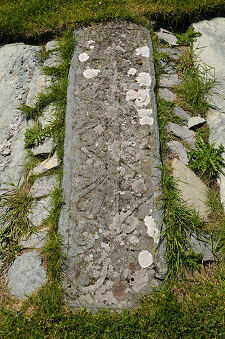 Most of these are now eroded beyond legibility, but one West Highland style grave slab, complete with the carving of a sword surrounded by foliage, has survived in relatively good condition. 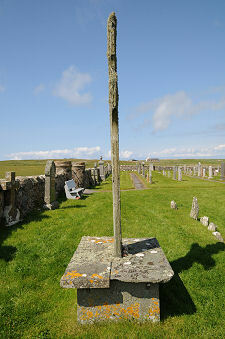 Much earlier than the chapel whose remains are on view today is the Kilnave Cross, which stands immediately to its west. This is heavily eroded, but stands some 3m high on a stone plinth. 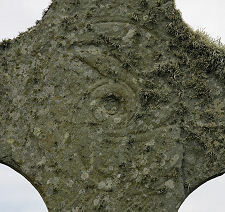 The west face of the cross appears to be plain, while traces of a circular pattern can be seen in the centre of the cross on its east face, with more patterns carved on the shaft and arms of the east side of the cross. The most striking thing about the Kilnave Cross is just how incredibly thin it is. 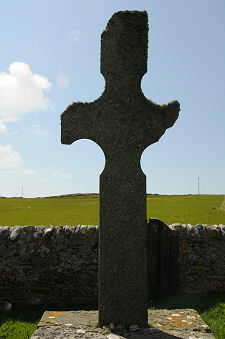 The Kilnave Cross is thought to have been erected here in the late 700s, and has been compared to the Kildalton Cross at the other end of the island. 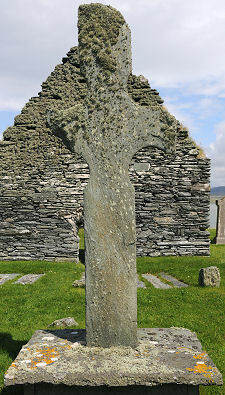 The Kildalton Cross is similar in size, but is a "ringed" cross (having a ring linking the arms with the head and base) while the Kilnave Cross is believed to have been ringless. But it is very tempting to wonder whether when originally carved the Kilnave Cross was as glorious as the Kildalton Cross remains today. Perhaps the main difference between the two was that the local stone chosen at Kildalton was exceptionally durable and hard wearing, while that used at Kilnave was much more prone to weathering. This might also help explain why the grave slabs at Kilnave are much less well preserved than those at Kildalton.